After much deliberation Mr. Marron contacted Eden Power to seek advice on a 4KW system on his listed Barn conversion. Eden Power showed him past installations on listed buildings with black conservation style panels and provided full roof loading calculations. Mr Marron had a 4 oven electric AGA and was amazed that his electricity meter wheel stopped dead as soon as the Solar System was turned on. 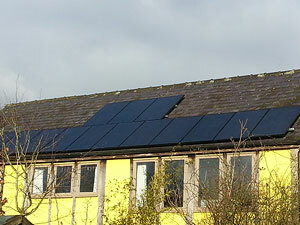 We fitted 16 Suntellite ECO 250W Monochrystalline all black panels with an SMA 3600TL inverter.